WhatTwoEatHere: Our Buy at Groupon via ShopBack! Our Buy at Groupon via ShopBack! We are back and this time, we have something that you all will like! Confirm ALL of you sure use before! It's this thing called online shopping. Now, we know some of you out there can get pretty addicted to online shopping because all you need is your eyes, a credit card and a good functioning mouse. He can tell you all about it because he could spend hours in front of the screen looking for the perfect fan for our future room. Speaking of that, yes we are getting married (if you did not already know that) in four months' time and we are currently doing a 'minor' renovation on our future room. Okay, back to this online shopping thing. I must tell you that whenever we want to try a restaurant out, we would usually head over to Groupon to see if they already have certain set meals and cash vouchers that we could purchase. At this point of our life, we will try to save as much money as we can. That is why we would like to share with you all our experience with this online shopping tool called ShopBack. Shopback is a cashback site that rewards your online shopping. I KNOW RIGHT. If you are a follower of her personal blog, you would already know that she is one the biggest fan of using Shopback whenever she needs to buy something online; be it an airplane ticket, booking hotel for holidays or getting meal vouchers. ShopBack is like a third party website where it helps you to earn cash rebate as you shop in various websites such as Groupon, Expedia, Zalora, Sephora and so much more. You can even earn cash rebate with internet providers' brand like Time. Click here to see her real experience with the part where she earns back her cash rebates. We love it so much that we used ShopBack to purchase the new air-conditioner and 2 fans for our house. The great thing is that when we shop via ShopBack, we do not only earn cash rebate, but we are also entitled to the respective website's discount promotion. For our case, we got extra 5% discount using the UOB credit card in Lazada, and after that we received the cash rebate in our ShopBack account. That is madness savings I tell you. 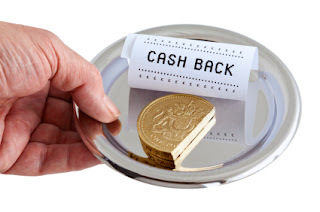 It's very easy to earn these cash rebates as you shop via ShopBack. The first step you need to do is to sign up for an account with ShopBack. If you want, you may sign up with this link and automatically you will receive RM5 on your first purchase. Then, head over to ShopBacks' Homepage and look through the categories to find the brand website that you would like to go to. For us obviously, we will go look under the F&B category so that we may enjoy the best food promotions because who doesn't like promotions man. Click on the brand and ShopBack will direct you to the website you desire. As long as you shop on the website that is directed via ShopBack, you will be guaranteed a certain percentage of discount. Brands like Star Newspaper, Malaysia Airlines, Foodpanda, Zalora, Crabtree & Evelyn, Olympus, Panasonic, Tesco, Royal Selangor, Lazada, Cotton On, Manchester United, Sephora, Taobao and the list goes on and on. It's practically 'you name it, they've got it' kind of website. I don't know about you, but online shopping is just never as painful anymore with ShopBack. We decided to buy a meal voucher at Groupon via ShopBack so that we could review on the food on this particular restaurant as well. Get cashback on Groupon deals, like seriously. We already bookmarked the website FYI. Heh. So, you guys gotta stay tuned to see what meal voucher we bought through ShopBack!